After the spectacular success of our Cantata for Canada I was very keen to find another choral-orchestral work for PEISO and our community. I wanted to identify an exhilarating choice that would enable PEISO to continue to break new ground in terms of repertoire — we have done reduced versions of Mahler 1 and 4 together, but none of Mahler’s other symphonies, and especially not his choral symphonies — and community engagement. I was especially psyched by the idea of a work that would focus on treble voices as this would enable us to use a youth chorus in addition to women’s chorus. The challenges in this, as in any other large-scale project, are both artistic and logistical. The artistic challenge is to ensure that what we present is unified, coherent, impassioned, and technically as strong as we can make it. The logistical challenges require astute scheduling and rehearsal as well as thorough behind-the-scenes preparation. 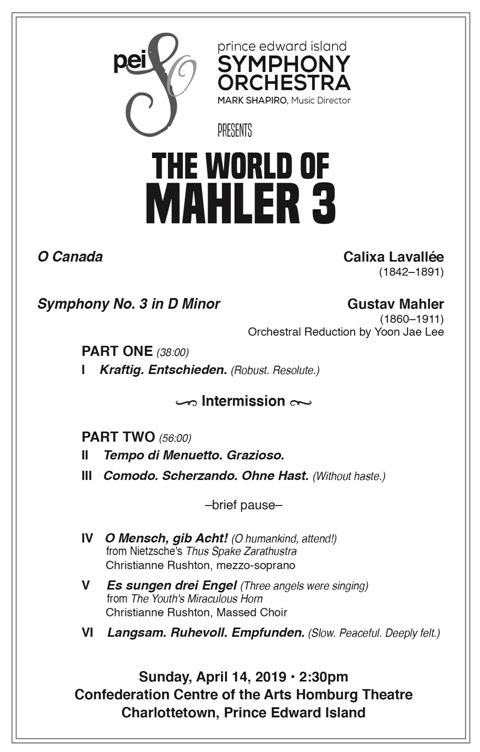 Mark will be sharing further thoughts and insights into this magnificent work and the challenges it presents in the preconcert chat on April 14 at 1:30 pm at Studio 1 in the Confederation Centre of the Arts.